We now offer our downloads in two different audio file formats: M4B and MP3. Both are compatible with iPhones, iPods and iPads as well as many other MP3 players and music player software. 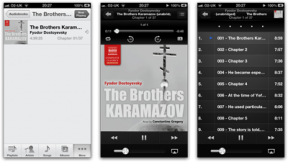 A Naxos AudioBooks M4B playing on an iPhone. After being transferred to the iPhone, it appears in the ‘Audiobooks’ section of the ‘Music’ app. When you purchase a download from Naxos AudioBooks you will automatically receive links to the full product in both formats. You do not need to download both formats but you are free to do so. M4B is an audio file format specifically designed for audiobooks. It is similar to MP3, but M4B collects many individual tracks into a convenient single file (some longer titles may be split into several parts) and ‘bookmarks’ your position when you stop listening, allowing you to resume listening where you left off. Naxos AudioBooks M4B files also contain useful chapter points to ease navigation within a book, and high quality cover artwork. A full accompanying booklet is supplied with each title as a PDF file. Naxos AudioBooks M4B and MP3 do not use Digital Rights Management, license keys or digital watermarking. M4B files are compatible with most current models of portable media players, although there are some important caveats – see below. We recommend checking the user guide of your device for information on compatibility and necessary software updates. • Currently, iOS devices (i.e. iPhone, iPad and iPod Touch) are not able to download M4B or MP3 files directly to the device outside iTunes. This means that such files must be transferred to the device via a computer. • M4B download links can be pasted into iOS apps such as GoodReader, which can download and play M4B files, although many of the convenient features of M4B will not be available. • Currently, Android does not natively support M4B and Android devices require the use of an app to play M4B files correctly. Many audiobook player apps for Android exist and some are available free. If the file extension of a Naxos AudioBooks M4B file is changed from ‘.m4b’ to ‘.m4a’ an Android device may be able to play it natively (i.e without the use of an app), although many of the convenient features of M4B will not be available. Naxos AudioBooks downloads are supplied as DRM- and watermark-free MP3 files, making them compatible with virtually all music software, and almost every portable music player and music-capable mobile phone on the market.</p> <p>They come complete with cover artwork and full artist and title information (plus a full PDF digital booklet), making them simple and enjoyable to use, however when using iTunes and/or an iPod/iPhone, there are a few specific tips which may help you to get the most from your NAB downloads. Before getting started with your downloads, you may wish to make sure you are using the latest version of iTunes: on a Mac, choose iTunes > Check for Updates…, or on a PC choose Help > Check for updates. To ensure that your downloads are copied into your iTunes library, open iTunes preferences (on a Mac: iTunes > Preferences… , on a PC: Edit > Preferences) and ensure that the ‘Copy files to iTunes Media folder when adding to Library’ checkbox is checked. The Preferences window in iTunes 9 on Mac OS X.
Naxos AudioBooks downloads are delivered as ZIP archive files. Once the file has been downloaded, you should be able to un-ZIP it by simply double-clicking on it, which should reveal a folder containing the MP3 tracks, booklet, and Terms and Conditions document. After un-zipping your download, you can import the tracks into iTunes: Open iTunes, then from the ‘File’ menu, choose either ‘Add to Library’ (Mac), or ‘Add Folder to Library’ (PC), then navigate to and select the folder of tracks. The tracks will be copied, and added to your iTunes Library. You can then delete the ZIP archive file and the un-zipped folder from the Finder/desktop. A great way of organising tracks and preparing them for transfer to an iPod/iPhone is to add them to a ‘playlist’. Playlists simply group specific tracks from your iTunes Library together. To create a new playlist, choose File > New Playlist. An ‘untitled playlist’ will appear in the Playlist section of the left hand pane. Simply start typing to name it as you wish. You can then drag your tracks/folder into the main pane, and they will be added to both the playlist and iTunes Library at once. 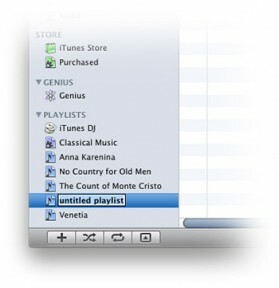 A new untitled playlist in iTunes 9 on Mac OS X. To see the tracks in a playlist, simply click on it. Songs play in the order listed, and by default – if you create a playlist of tracks from a Naxos AudioBooks download – they will play in the correct chapter order. 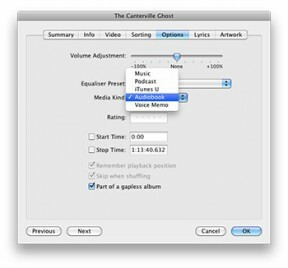 If you choose to sync tracks to your iPod/iPhone manually, playlists make syncing entire audiobooks quick and easy. When your iPod/iPhone is connected, and selected in the left-hand pane, click the ‘Music’ tab in the main pane. You can choose which playlists to sync by checking them in the ‘Playlists’ pane. The latest versions of iTunes allow you to change the ‘Media Kind’ of tracks in your iTunes Library. You can set a track to appear in ‘Music’, ‘Podcasts’, or ‘Books’ sections of the Library in iTunes, or on an iPod/iPhone. To change the Media Kind, or other options for files, select the tracks you wish to change, then choose File > Get Info. In the ‘Options’ pane of the pop-up window, you will find a drop-down menu where you can specify the Media Kind, and check boxes to turn on or off other features. 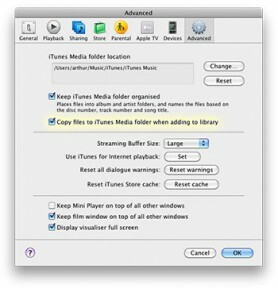 To make the files appear in the Audiobook section of iTunes and your iPod/iPhone, change the Media Kind to ‘Audiobook’. The ‘Get Info’ window, and Media Kind drop-down menu in iTunes 9. Check the ‘Remember playback position’ check box to make sure you can pick up your book where you last left it. Click the ‘OK’ button to save the changes to all the files at once. You can leave the Media Kind as ‘Music’, and browse your NAB audiobooks by Album or Artist as you would with music tracks, but flagging them as Audiobooks enables some interesting features on an iPod/iPhone, such as speed control, and a button to instantly skip back 30 seconds. Also, if you pause your book, and return to it later, your iPod/iPhone will show you which track you were listening to, and how much of that track is left to listen to. If you are having a specific problem with Naxos AudioBooks Downloads, please contact Download Shop Customer Service. Please note we are unfortunately unable to provide support for other provider’s products. These guides are provided only in order to assist you and are intended for use in conjunction with the Naxos AudioBooks Download Shop only. These guides may also relate to providers that are not Naxos AudioBooks. Naxos AudioBooks cannot accept responsibility for external websites. These guides are available for use at the user’s own risk and Naxos AudioBooks accepts no liability whatsoever for any loss you may incur arising out of your use of these guides or the information contained within them. You expressly accept this by following the guidance contained in these guides. iTunes, iPod and iPhone are trademarks of Apple Inc., registered in the U.S. and other countries.